Bali presents the ideal vacation experience for the worldly traveller. With unrivalled panoramic views of the Indian Ocean, Banyan Tree Ungasan Bali Resort presents the Bali experience, pure white beaches, the promise of perfect blue waters and golden sunshine, the antidote to the demands of modern life. 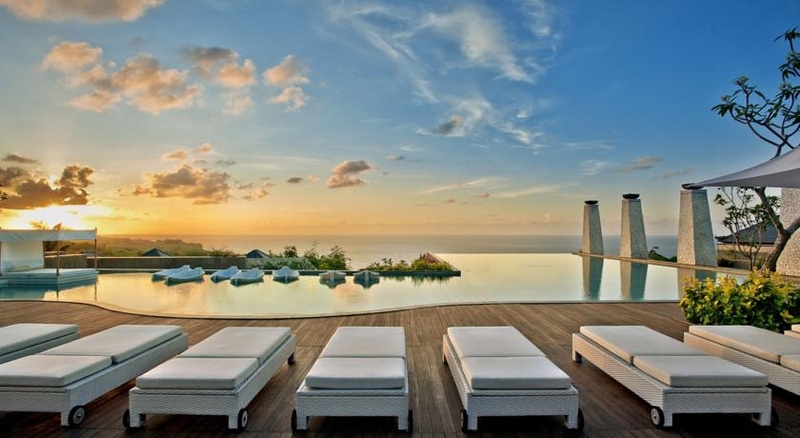 Perched 70 meters above sea level on the cliffs of Bali's southernmost peninsula, close to the famous Uluwatu Temple, the resort offers the highest level of comfort and privacy synonymous with the Banyan Tree brand. Villas: Pool Villa Garden View (1 bedroom), Pool Villa Sea View (1 bed), Pool Villa Ocean View (1 bed), Pool Villa Cliff Edge Ocean View, Sanctuary Villa Garden View (2 bedroom), Sanctuary Villa Sea View (2 bedroom), Sanctuary Villa Ocean View (2 bedroom), Sanctuary Villa Cliff Edge Ocean View(2 bedroom), Presidential Villa (3-bedroom).